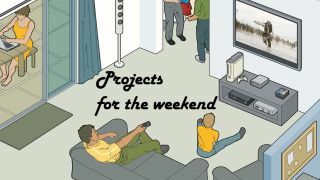 Now that it's the weekend you should have a chance to get stuck into all of those tech projects you didn't have time for during the week. To make things easier we've rounded up the best of our how-to guides from the past seven days, hopefully giving you inspiration for cool things to do with your tech. This week we welcomed Digital Camera World into the techradar fold, so we've got a couple of brilliant photography guides that will get you running to grab your camera this weekend. It's also time to unwind, of course, and as we've been celebrating PC Gaming Week here at techradar, we've got some great projects for gamers as well. Windows 10 does a lot of things right, but it can be annoying as well, especially when it adds unwanted app suggestions to the Start menu. To wrestle back control of your OS, check out our How to remove pre-installed app suggestions from Windows 10 guide. If you're a PS4 gamer then there's a good chance you'll be spending this weekend playing the awesome Uncharted 4. However, if you find you're struggling to fit the game on to your hard drive, then follow our How to upgrade your PS4 hard drive guide, which now has a step-by-step video to show you how to replace the hard drive quickly and easily. Want to give your PC a new lease of life? One of the best ways of doing so is to upgrade your RAM. In our Everything you need to know about upgrading your RAM guide we dispel the myths about upgrading RAM, and show you everything you need to know to give your PC a speed boost. If you want to give your graphics card a workout to see just how powerful it is, read our guide on How to benchmark your graphics card. Running benchmarks on your GPU can also help you troubleshoot problems your PC might be experiencing, so it's well worth doing this weekend if you're worried that your graphics card isn't performing as it should. This project isn't for the faint-hearted, but if you want to give your Android phone a radical overhaul then installing CyanogenMod, an alternative to the Android operating system, is a great way to unleash the full potential of your smartphone. We take you through the steps in our How to install CyanogenMod 13 on your Android phone tutorial. If you have a 4K TV you can make great use of it by connecting it to your PC – either directly via HDMI or by streaming over your home network – and playing games in all their ultra-high-definition glory. We look at the various ways you can do this in our guide to playing PC games on a 4K TV. Is the good weather finally here to stay? We don't want to jinx it, but if you're having lovely sunshine this weekend where you are, then check out our guide to the Best camera settings for outdoor portrait photography. If the weather isn't all that great, we've also got guides to help you take great indoor shots. In Flash photography tips: external flash techniques anyone can understand, we show you how you can improve the look of photos you take using a flash. If you've got a Linux machine it doesn't mean you need to miss out on playing games, as our guide on How to get gaming on Linux shows.